Twenty-two people were sent to hospital for treatment after inhaling ammonia during a leak at a meat processing factory in central South Korea, local firefighters said Thursday. The gas leak happened at about 9:40 a.m. in a meat processing facility located in Eumseong, North Chungcheong Province, about 130 kilometers south of Seoul, according to the firefighters. Twenty workers in the factory and two others working at a nearby manufacturing plant were taken to hospital with nausea. They are all reportedly in stable condition. 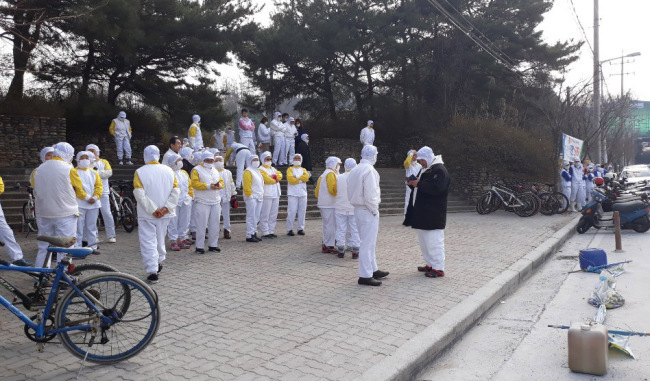 More than 340 workers at the factory, run by Nonghyup Moguchon, an affiliate of South Korea's agricultural cooperatives, were evacuated from the building. Authorities suspect that the gas valve was somehow damaged after being hit by a 25-ton cargo vehicle. Firefighters have cut off the gas.